Andrew Spence is an experienced and thought-provoking speaker on topics relating to People Management, Designing HR services to deliver business results, The Quantified Workplace, HR Transformation, People Analytics, Future of Work and Organisations and Blockchain and the CHRO. Andrew has given speeches in London, Paris, Amsterdam, Athens, Brussels, Copenhagen, Budapest, Moscow, Melbourne, St Petersburg and Sydney. Andrew has also Chaired and acted as moderator at many conferences and panels. As well as public presentations, Andrew also speaks to organisations at internal events tailored to suit the context of the event. My speech, "The Role of HR in Reinventing Organisations; Embracing People Analytics" delivered at the Workforce Analytics Summit in Sydney in 2016 has over 19,000 views on Slideshare. 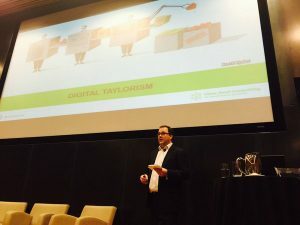 Tech HR – Singapore 28th February 2019 "How Blockchain will Change the Way We Work"
Natural HR Annual Conference, Birmingham, UK, 29th November 2018 Andrew delivered his keynote speech on "How HR can lead the design of better workplaces"
Hays Leadership Forum, Ipswich, UK, 22nd November 2018, Andrew spoke about "The Future Of Work With Artificial Intelligence & Emerging Technology"
"From Evolution to the Work Revolution", Andrew delivered the keynote speech with Professor Eske Willerslev, Evolutionary Geneticist. Andrew Spence was on the panel discussion, "Will automation and artificial intelligence help or hinder good people management?" EG People – The Workplace of Tomorrow, London, 22nd May 2018 – Andrew's keynote speech was on "How to Transform Your Organisation"
Blockchain and the Distributed Workforce, Rocketspace, Angel, London, 18th April 2018 – Andrew hosted an evening event with speakers, start-ups and a panel dicussion – read the write-up here -> "Blockchain in HR: Challenges, Applications and the Future of Work"
Andrew Spence chaired the People stream, two of the panels and hosted a roundtable discussion on blockchain in HR/people management. Andrew Spence delivered his speech “The Impact of Technology on People Management“ at the plenary session to over 1000 delegates. Andrew's speech was called "The Future of Work is Here…Or Is it?" Andrew delivered the keynote speech on "The Opportunities of Automation in HR"
How People Analytics can help reinvent organisations in an event hosted by Perkbox. 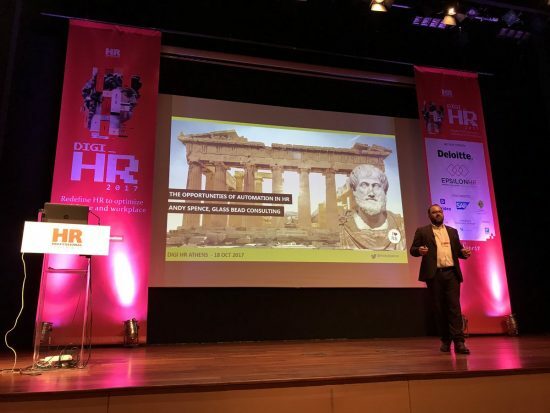 Andrew spoke about "Key Questions for the Future of Work and HR" and also "People Analytics – The Heart of Your HR Transformation"
Andrew facilitated a discussion about the opportunities of emerging technology on the workforce. Andrew was moderator in the HR Tech stream over both days. Andrew delivered a speech on "The Role of HR in Reinventing Organisations: Embracing People Analytics"
He also, contributed to the panel discussion "The Past, Present and Future of Workforce Analytics"
Andrew was moderator at disruptHR, a showcase exhibition for startups in the HR space. Andrew Spence was Co-Chair of the Conference over 2 days. Also moderated the Panel "What's next for HR? Key Trends and Challenges to Prepare for in 2015" with Linda Holbeche, Gary Kildare, Stacia Sherman Garr, Bernard Marr and Gareth Williams. Andrew was Conference Chair for the 2 Day Conference. 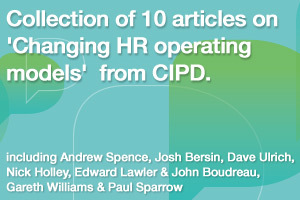 HR Zone guest article What are the opportunities for automation in HR?